home-sick | Borgers with No Borders. our lives, our loves — through our earthly adventures. Some of you might start thinking that I have either gone psycho or am heavily into drugs. No. I am neither of those. I am just home-sick. Now I realize that spending two months of the summer vacation has its minor drawbacks. But hey, I’m not complaining. I just want my ensaymadas. Huh? Did anyone just say ensaymadas? Again??? Are you still on that page? 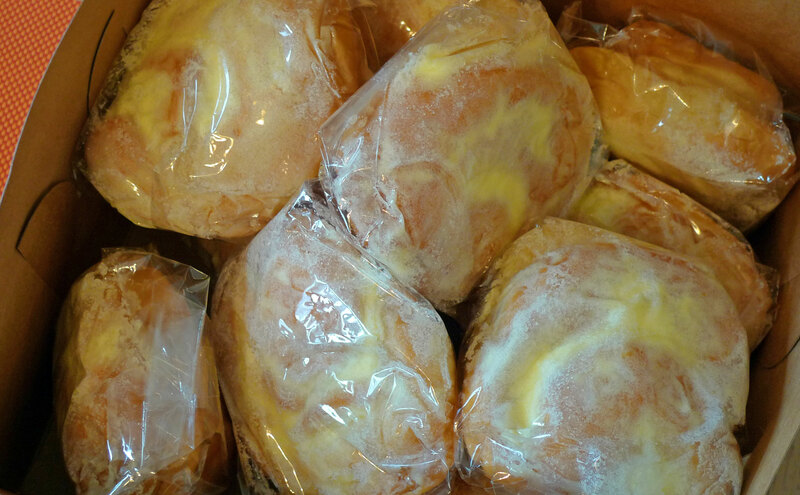 Hasn’t your craving already been satisfied by two dozens of them coming all the way from New York? I did a whole lot of research on the good old web for the perfect recipe that would match the ones in my dreams. (Not that the ensaymadas of Chari didn’t match my dreams. They did. Only I would be a fool to ask her for the recipe!) Turns out, the daughter of a friend who just finished her “stage” days at Alain Ducasse’s resto here, has a friend who has a (supposed) killer recipe on hand. I am truly blessed. How these things just happen to fall on my lap is a good sign. I knew I could not keep ordering ensaymadas all the way from California and having them shipped over to me in Paris, right? I knew I could not keep begging my sisters to send me some. I knew my hubby would not dare ask his airport friend for more. I knew. I knew I just had to be … SELF-RELIANT! Because it is only when one is self-reliant that he is truly free! At least that’s what they say. So off I went into the kitchen this morning to cook up a storm. My first attempt at making my very own, self-reliant, from the heart, ensaymadas. Lesson # 1: Freakin’ don’t ever try to cook ensaymadas using muffin pans. Lesson # 2: Try and try until you are happily and securely self-reliant. I’m not there yet. As you can see from the pictures. But I will not give up. And when I do get it right, by golly, I will share with you my very own, labored-on, tweaked, tried and tested recipe of my self-reliant-making-ensaymadas. Someone is hiding some secrets which I have yet to uncover. 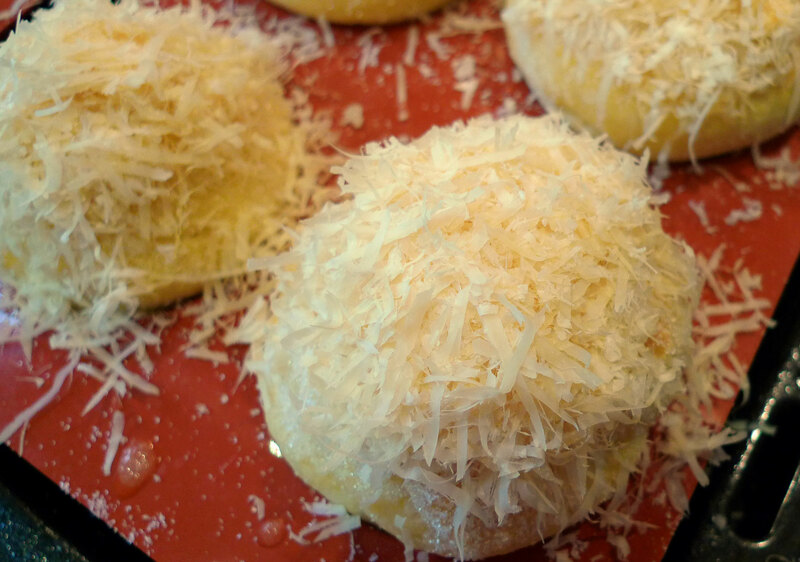 Like: How do you keep the grated cheese from not falling off the top of a round ensaymada like that? Stay tuned. 🙂 I promise I will be back. 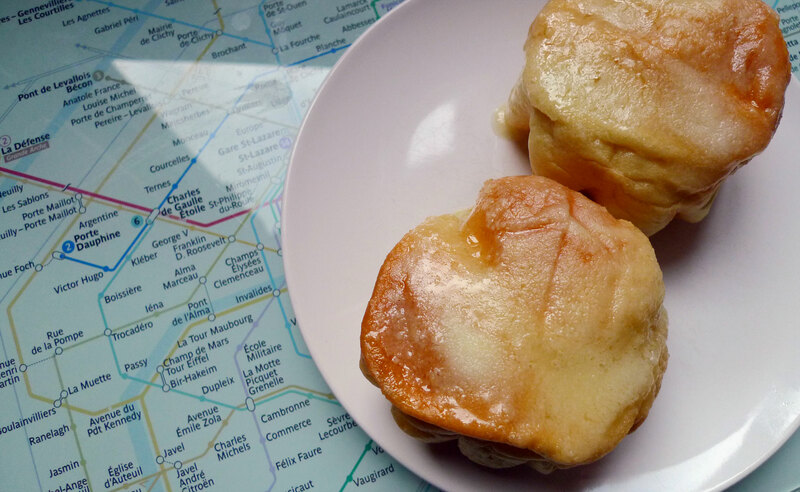 Home is where the heart ensaymada is. After spending two months of our summer vacation in Manila — which we consider to be our REAL home — we were faced with “la rentrée” blues. Not that we were complaining to be back in Paris — but just reveling at the wonderful time we had at home with family, starting with all the food indulgences we embarked on and … well, ending with that. I must have been terribly homesick because two weeks after we returned, I found myself writing on my Facebook status: “I would do anything to have an ensaymada and a gallon of Chef Tony’s Popcorn right now.” And what do you know? Glorious FB does its magic… and soon enough, I had over twenty comments and tons of “Likes.” It was comforting to know that other people who were not in Manila could identify with this sudden urge to eat ensaymada. It was more than an urge. It was an impatient craving, and one that would not wane. Enter my dear high school classmate, JF, who lives on the other side of the world: in America, where, I believe, you can find anything your heart desires. She whets my appetite even more and tells me about a friend of hers who lives in California, who makes the best-ever tasting ensaymadas in the whole wide world. 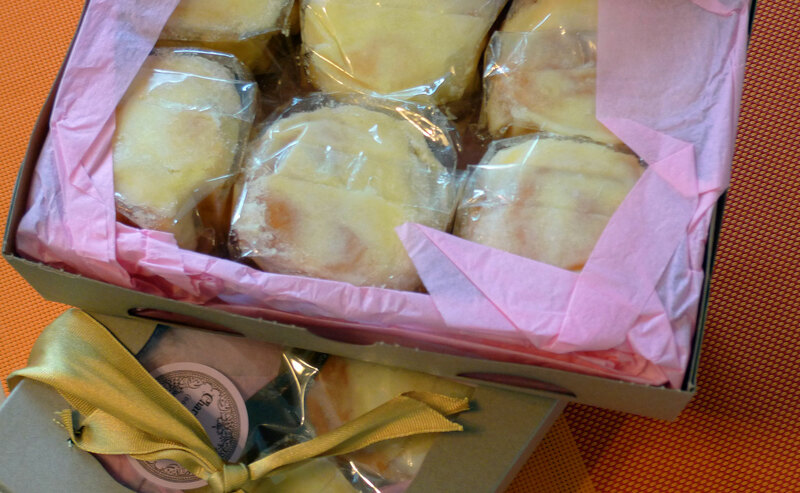 Two days later, I find myself writing this much-acclaimed ensaymada maker, asking her if she would please send me some via DHL. The cost was not an issue, knowing that it would cost me more to see a psychiatrist to manage this urge than to actually satisfy it myself. Before I could spell ensaymada, I made a paypal account payment, emailed Chari (the Ensaymada Goddess) a hundred times to give the hotel address, arrival date, departure date, and all other information that would guarantee that the precious shipment would make it to NYC in time to make it to Paris. Chari got everything perfectly done … including getting an insurance, yes… an insurance! … to make sure it landed in the right hands at the right time. Of course, during all this frenzy, my hubby had no clue about what was soon to arrive in his hotel room. HUBBY: Received your “pasalubong” (present from a trip) but it is quite a decent box and I don’t know how to fit this in my suitcase. Remember, I’m taking a motorbike transfer from the Airport when I arrive. Gulp. My ensaymadas were treading in dangerous waters. MY REPLY: Darling, just throw the box and put them all in a plastic bag, then squeeze them all into your suitcase. I don’t mind if they get squashed. Pretty Puuullleeeezzzz? No answer. Couldn’t sleep a wink. Wednesday morning, hubby comes home from the airport and hands me a big shopping bag with a huge box inside. He said, “This is a present for you from the Filipino guy at the airport who has become my friend.” Apparently, through his travels, he met this very kind Pinoy at the airport who has become a friend… and as he was leaving, he had mentioned to the guy that he was bringing home ensaymadas for me. The Pinoy goes, “Your wife loves (understatement) ensaymadas? Wait here! I’ll be back.” And in an hour, he was back at the waiting lounge with this big box of something for me. I shook the box a bit, smelled it … and ransacked it only to find… not Chari’s ensaymadas… but someone else’s ensayamadas!!! Just MORE ensaymadas than I had ever hoped for! Pinoy Kind Man apparently had a sister who owned a bake shop in NYC, not far away from the airport. Now if that is not serendipitous… I don’t know what is. I think I must have jumped and skipped at this point. And he revealed … these two ever-so-lovely boxes, daintily wrapped in goldish ribbons, slightly squished but not losing an ounce of its familiar grandeur. 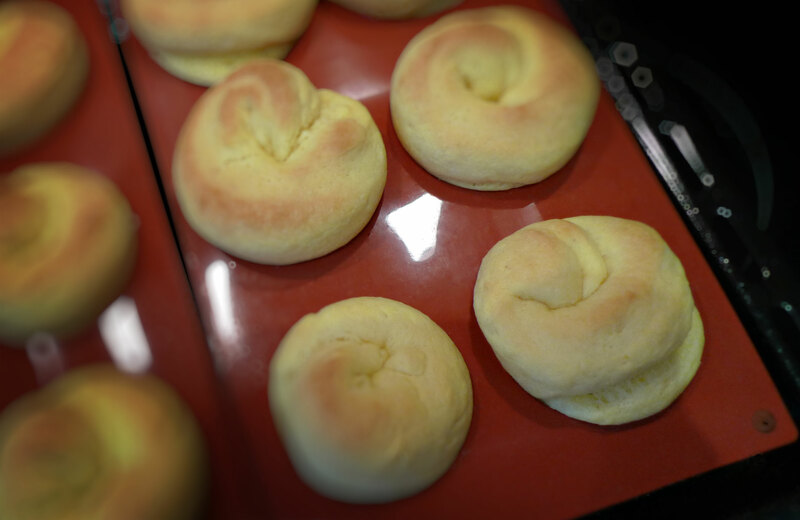 In a flash, I was in the kitchen, zapping Chari’s ensaymadas for 15 seconds, watching the butter, the cheese, and the sugar slowly melting into a sumptuous oozing blanket of plain and unadulterated goodness. One bite. And suddenly, … I felt like I was home again. Order yours now, cause I ain’t sharing. She is also has a Facebook account (Chari’s Kitchen) which you can find here.